We have the technology, no matter how big or small your sewage problem is. We solve an average of 4,500 issues every year. We clean sewer pipes, standpipes and household drains using pressurised water or motor spirals. And we’re fast. We work mainly in Prague and the Central Bohemian Region. We clean everything - no job too small. Municipal sewage, water mains gutters, outdoor pipelines, standpipes, household drains and blocked toilets. And we’ll never shirk from emergency situations. We’ve seen a whole host of them over the past 22 years. A clogged pipeline is a big issue. Solving an emergency is all a matter of time - we promise to get to you within one hour Our technology is 4 times more powerful than standard cleaning equipment. We’re faster, and better value. 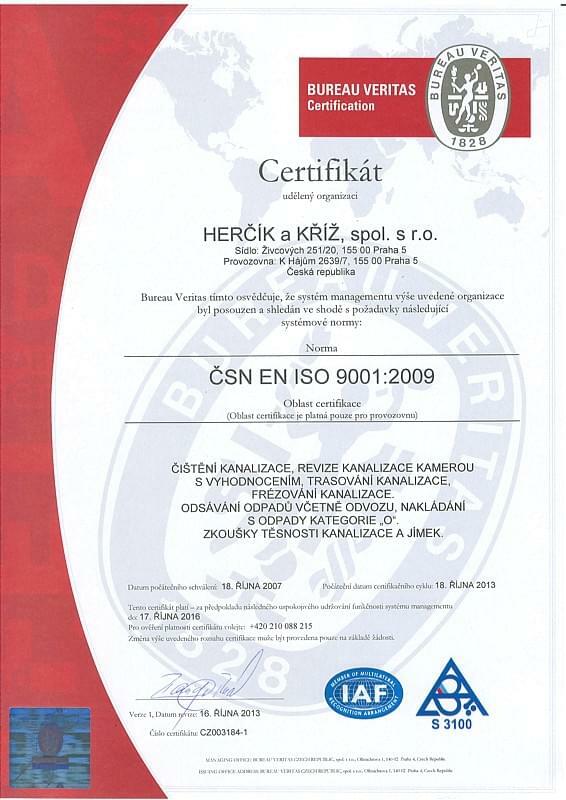 And our quality certificate is proof of our high professional standards. Are your drains blocked or draining poorly? We clean household drains with motor spiral or using pressurised water. Our cleaning vehicles use both so we can solve standard problems in one trip. We solve all problems with sewage, so look no further. Our 12,700 satisfied customers are the proof. If your pipeline is blocked by ingrowing roots or leaked concrete, we’ll mill it away. If there has been repeated blocking, we detect the cause with our camera system and suggest a method of repair. In case of emergency, call +420 722 153 921 between 6.30am and 6pm. Otherwise just describe your problem and a member of our team will give you a quote and arrange a date for cleaning. We can also call out to inspect your defect and suggest further procedures.